A young boy makes a paper heart to give to the one he loves the most, and although he sees many people he loves during the day, he still has it when he says his prayers at night. - Publisher A little boy, whose heart overflows with love, has made an "I love you" card, but now must determine to who should receive it. At the end of the day, he still has his card, although it is a little worn, and he decides to give it to the one he loves most. The theme of counting blessings prevails a the boy realizes just how filled with love his life is. A little boy, whose heart overflows with love, has made an "I love you" card, but now must determine to who should receive it. At the end of the day, he still has his card, although it is a little worn, and he decides to give it to the one he loves most. The theme of counting blessings prevails a the boy realizes just how filled with love his life is. 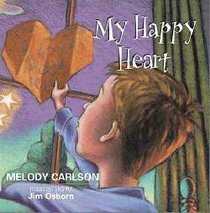 Melody Carlson has published over ninety books for adults, children, and teens, with sales totaling more than two million and many titles appearing on the ECPA Bestsellers List. Several of her books have been finalists for, and winners of, various writing awards, including the Gold Medallion and the RITA Award. Some of her popular multi-volume series include Diary of a Teenage Girl and True Colours.